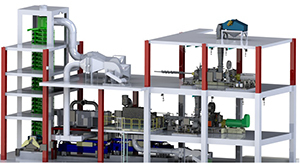 Anderson International Corp revolutionalized the mechanical drying of synthetic rubber process. In the 1930s, Anderson International developed another use for the Expeller® outside of oilseed processing: the mechanical drying of synthetic rubber. By combining both the Expeller and the Expander/Dryer the process of drying synthetic or crumb rubber was quickly revolutionized. Until the development of Anderson’s Expander/Dryer®, the typical drying process involved apron dryers that consumed massive amounts of heat energy. The Expander/Dryer offered a much more economical solution for the industry. A rubber finishing line is engineered to separate the rubber crumb from the process water, and to produce bales or bags of dried finished rubber. The polymerization reaction takes place in a liquid solution. Once the reaction is complete, the product is saturated in water. Before the raw crumb rubber can be formed, the moisture level must be significantly reduced. The slurry of crumb rubber is transferred from tanks to dewatering screens that effectively remove the free water. Through mechanical dewatering and drying processes, the product can is then reduced from 95% moisture down to 2% or less in just a few minutes. The porous crumb is then conveyed along a vibrating conveying system for final moisture reduction, cooling and elevation for packaging. Typically a baling or bagging packaging system is installed immediately following the vibrating conveyor system. Our team of process and engineering specialists can provide guaranteed process solutions for capacities from 100 kg/hour to 12,000 kg/hour, designed to reduce moisture to 0.5% or less. Today, Anderson supplies and services complete “Gold Standard” dewatering finishing lines for all types of materials in the synthetic rubber industry. Anderson is ISO 9001:2015 with Design Certified and can provide your integrated finishing line needs from crumb to bale. What Constitutes a Polymer Finishing Line? Anderson provides processing solutions that solve our clients’ biggest challenges and achieve outstanding results. Our certified, experienced team is dedicated to tailoring end-to-end solutions that meet your needs now and lay a foundation of success for the future.